We loves Pig. He is so funny and cheerful and huggably porky. But definitely not like pork pie at all. No way. He looks so cute we is wanting to scratch him under the chin. Plus, he’s taught us his special Pig language. Is that a clever pig or what? All of us wishes to take him home. But Pig is already adopted by two vegetarian farmers. He even has a new best friend: Kitty. She is super nice. Pig is super happy. Silly old Duck only says Kitty is super evil cos he is jealous. Right? Love reading about animals? Here are our top tips of old favourites and the best new titles. Oink! 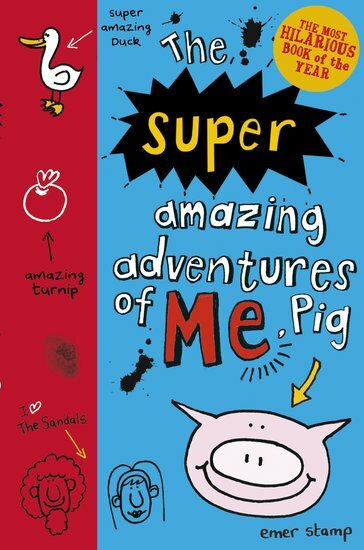 Get inspired by Pig and doodle some farmyard funnies with our free download. We laughed our socks off! Kitty is super wicked but thanks to Pig’s friends she does not get the better of him – never judge a book by its cover or a cat by its fur! I give this book infinity stars and beyond. I thought this book was an amazing sequel. It made me laugh a lot! At first Pig thinks Kitty is nice(she is) but if you keep going she is not! Pig thinks every thing is real but it is isn’t as he is being tricked! For example, she drew a picture of a retirement home for farmyard animals but it is actually a pie-making service, so Pig and his friends can be made into pies! What are you waiting for? Read it yourself because it is SO funny! Emer Stamp grew up on a farm in Devon before training in graphic design and becoming the Creative Director for the advertising agency behind the John Lewis Christmas adverts. The Unbelievable Top Secret Diary of Pig is her debut novel.